Home » 2013 » April » 11 » And the Oscar goes to…an octopus? Have you ever wished that you could change your appearance and look like somebody else, even if it is just for awhile? You may be surprised to know that this is entirely possible – for some animals at least, and that it serves an even more important function of self-defence for these fascinating creatures. In the animal kingdom, this is a sophisticated process known as mimicry. According to Breed & Moore (2012), mimicry “ occurs when one species evolves to look, sound, smell, or act like another species (p. 283). Mimicry differs from background matching. The latter term refers to an animal that looks like its background. You can consider mimicry to be a more advanced and deceptive form of self-defence as it usually involves looking like some other organism. In background matching, the animal often evades notice. A mimic, however, may be noticed, but it is perceived to be another organism. Ordinary looks on an ordinary day. The mimic octopus is the first known species that is able to imitate not only the appearance, but also the behavioural characteristics of multiple species. 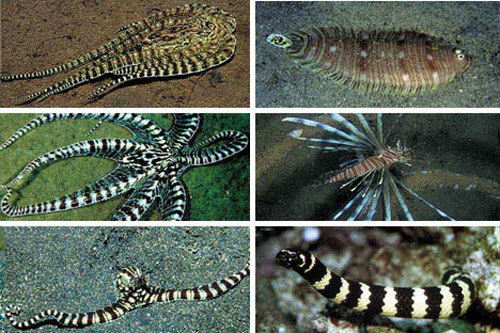 Interestingly, the mimic octopus takes on the form of venomous creatures such as the lion fish (Pterois) and sea snakes (Hydrophiinae) as seen in the following image. The mimic octopus is on the left column, the animal that it is imitating is on the right column. 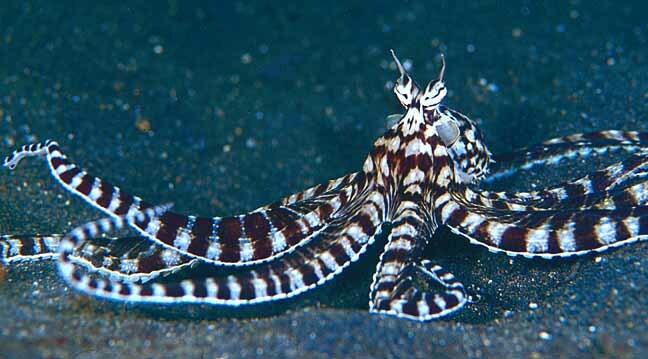 The mimic octopus – a master of disguise? Proven. Fascinating? Absolutely. More research is underway, and hopefully we will be able to unlock some of the secrets and discover more about this intriguing creature. I would certainly like to take some lessons. Norman, M. D., Finn, J., & Tregenza, T. (2001). Dynamic mimicry in an Indo-Malayan octopus. Proceedings of the Royal Society B: Biological Sciences, 268(1478), 1755–1758.